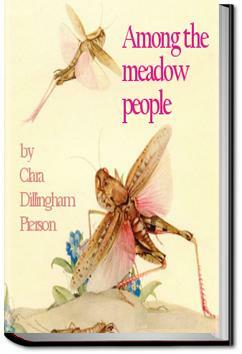 Lovely book of nature written for children by teacher and naturalist Clara Dillingham Pierson. This book in the "Among the People" series explores the animal inhabitants of the meadow and garden. In one of the Ant-hills in the highest part of the meadow, were a lot of young Ants talking together. "I," said one, "am going to be a soldier, and drive away anybody who comes to make us trouble. I try biting hard things every day to make my jaws strong, so that I can guard the home better." "I," said another and smaller Ant, "want to be a worker. I want to help build and repair the home. I want to get the food for the family, and feed38 the Ant babies, and clean them off when they crawl out of their old coats. If I can do those things well, I shall be the happiest, busiest Ant in the meadow." I have been reading this series of books to my children. They are cute little stories told about the animals and insects that love in a meadow. They are told from the perspective of the animals. Each one has a little moral/message to learn. We have really been enjoying them! Cute little kids book about the Meadow People (butterflies, grasshoppers, spiders, snakes and frogs) - with little lessons within each story to remind you what happens if you are a cranky gossip and how it is better to be kind and pleasant.